21 Jump Street has its roots as a cheesy '80s TV show that's notable for launching the career of Johnny Depp. Like a lot of '80s cheese, it has gotten the reboot treatment in the form of a movie. And then a sequel. 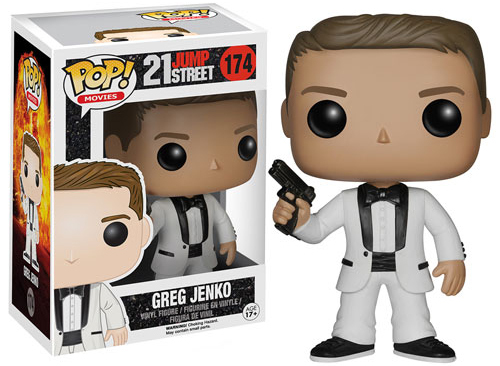 The 2015 Funko Pop 21 Jump Street vinyl figures go the reboot route, covering the two main characters. 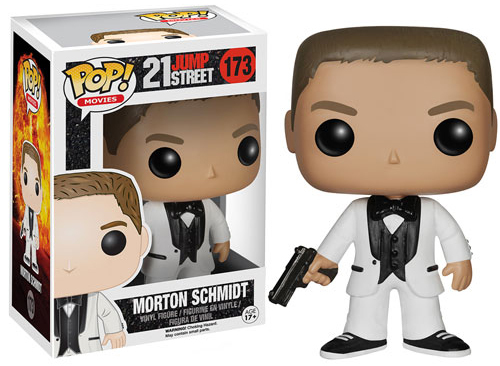 Morton Schmidt (played in the film by Jonah Hill) and Greg Jenko (Channing Tatum) are decked out in their white tuxedos and packing some heat. The initial lineup has no love for Ice Cube's character, Captain Dickson. Part of the Pop! Movies line, both of the figures stand about 3 3/4 inches.